Seen below is a photograph showing two views of a pair of white gold wedding rings I made to fit a very specific engagement ring earlier. 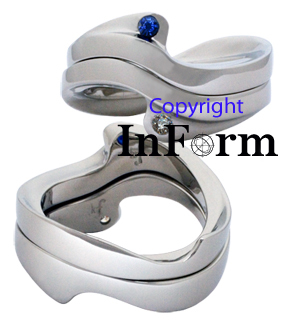 Clicking on the picture below as well as the links below it will take you to a location where you'll be able to view this pair of rings along with the engagement ring. ***Please note that a pair of rings bearing a reasonable degree of similarity could also be made. I'm able to make rings of platinum, palladium, white gold as well as other colors of gold.